This is an advertisement published in about 1890, when the Welling’s had just moved into Cantonment, the Church of England already existed hence Church Road, (Lytton Road now) not to be confused with Church street in Camp, which name is given much later! The Welling’s originally came from Goa, the village Velling sic Veling, but never used the surname Welling. They preferred to the used the oft practiced South Indian, way of mentioning names without the surname – Hence the name Shriniwas Mahadeo and Son. My wife was searching some old pictures and what he find out her great grandfather black & white photo, dated back to 17-06-1910. 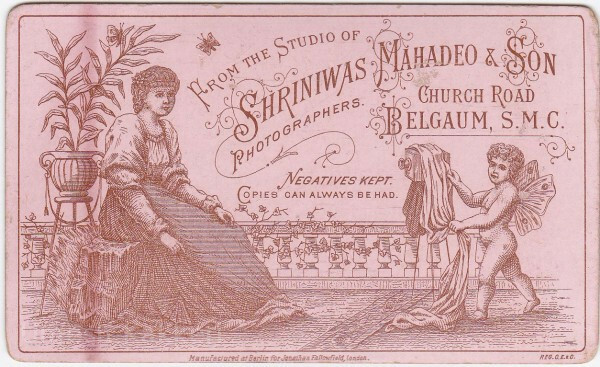 This photo was taken at Shriniwas Mahadeo & Son photo studio. I wonder if this studio still exist? IT TAKES US BACK TO THE YEAR OF 1890.